How do I sell event registration tickets? Learn how you to set up and sell event registration tickets. Click the “You” in the top right corner and click “Admin Dashboard” for your organization. If you are an admin of more than one organization make sure you click the one with the event you want to work on. From your Admin dashboard, navigate to the "Fundraising" tab and click on the "Events" link. From there, select the "Edit" button under the event you are looking to create a registration form for. 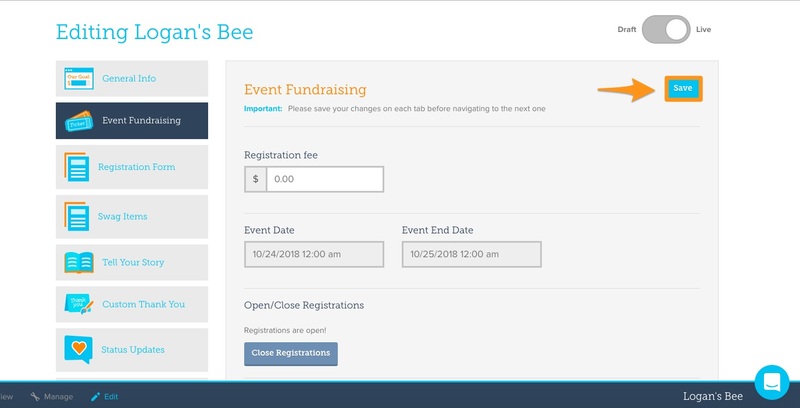 Click the "Event Fundraising" tab, and select "Add Registration Type". These registration types are options to sells tickets and distinguish between "walkers" and "runners" or "adults" and "children" at an event for example. Step 4: Save your "Registration Type"
Once you have finished adding registration types, click the blue "Save" button. Note: If you have any questions, feel free to reach out to our customer success team via the blue chat bubble on the bottom right of the screen, or send us an email at customersuccess@givegab.com.